Unlike most most Mardi Gras season parades, Krewe d’Etat is not led by a benevolent king but by a disgruntled dictator. For 23 years the dictator has tried to foment revolution among the Carnival masses in New Orleans. 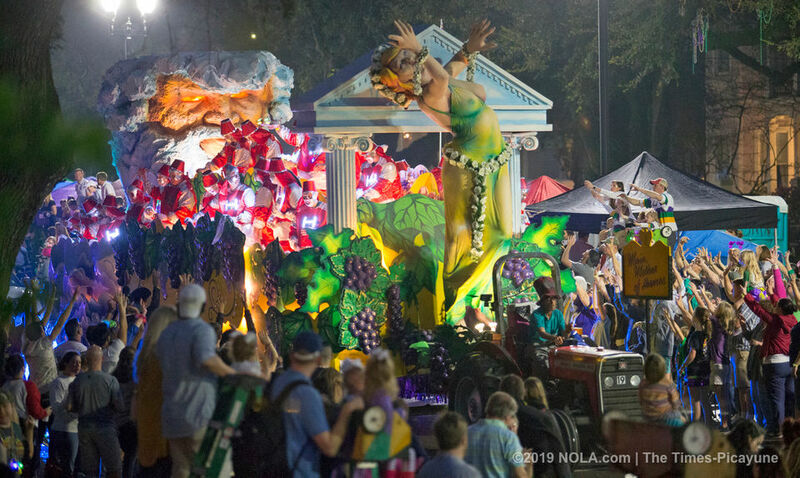 On Friday night (March 1) it seemed that the dictator might finally get the downtrodden along St. Charles Avenue to rise up. His 2019 strategy was to point out the sickness of contemporary society. In diabolically designed float after diabolically designed float, the dictator illustrated illnesses, such as the “chronic incontinence” that afflicts the Sewerage & Water Board, the “Montezuma’s revenge” that seems to have infected President Donald Trump and all those seeking to build a border wall, the convenient “amnesia” that befell a recent Supreme Court nominee and the willful “blindness” that arose recently among NFL referees. The dictator’s always amusing all-male dance troupe costumed as sight-impaired referees. At times Friday’s crowd seemed to be seething with just the discontentment for which the dictator hoped. Spectators raised their hands and flailed in in anger at the foolishness of what passes for contemporary civilization. Or maybe they were just reaching for beads. One impediment to the dictator’s desire to unite the people in insurrection might be his willingness to alienate almost everyone. The dictator is entirely liberal in his view, in that he is aggrieved by absolutely everything. On the national scene, he laid the foibles of “genetic testing” at the feet of presidential candidate Elizabeth Warren, the Massachusetts Democratic senator who was embroiled in a controversy concerning her Native American ancestry, and accused Vice President Mike Pence of “insufficient libido.” Though the dictator generally eschews the crudity of Krewe du Vieux, he did compare special counsel Robert Mueller to a proctologist. D’Etat is a deliberately provocative series of political cartoons on wheels. As the last float passed, it seemed possible that spectators had been so stirred that they would finally rally behind the dictator, leaving their ladders and folding chair barricades to join him in storming some other sort of barricade. They couldn’t of course. The Morpheus parade was just a block behind, and there was barely time to get a cold beer and bite of fried chicken, much less join a revolution. Better luck next time. Willful Blindess float will mock controversial play in NFC Championship Game.